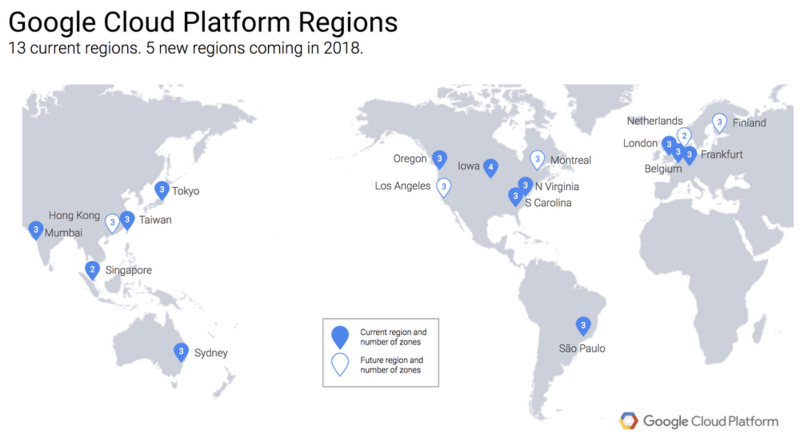 Google is rolling out another expansion to its cloud computing platform by adding five new regions. This will allow them to offer cloud services with endpoints closer to their customers. To further improve cloud performance, Google also plans to build three more dedicated undersea cables with improvements costing a massive $30 billion (and counting) over the last three years. New regions in the Netherlands and Montreal will open in Q1 2018 while sites in Los Angeles, Finland, and Hong Kong will open at a later date. These regions are geographically separate from one another and each region is then divided up further into a handful of availability zones at that region. Customers typically deploy their applications across multiple regions and zones. This type of network architecture is meant to help improve stability in the case of natural disasters or other failures. Moving to 2019, Google has plans to commission three undersea cables: Curie, Havfrue, and Hong Kong-Guam. The first will be a private cable connecting Chile to Los Angeles, the second is a consortium cable connecting the US to Denmark and Ireland, and the third is another consortium cable connecting numerous hubs in Asia. Google estimates that their network handles about 25% of all internet traffic. They have invested in directly or leased space on numerous such cables to deliver their services to a growing area. With the construction of the Curie cable, Google will become the first non-telecom company to build its own undersea cable, allowing them to better control the specifications of the cable and increase their overall bandwidth as consumers demand more connectivity.